Meet the game Chillingo says can dethrone Angry Birds. Chillingo just can't get enough rope. After achieving great success with the award winning Cut the Rope, the publisher is set to launch Rope Rescue, a promising title from Untame Games that the company says can replace Angry Birds as the number one App. Having seen the game in action, we understand why. 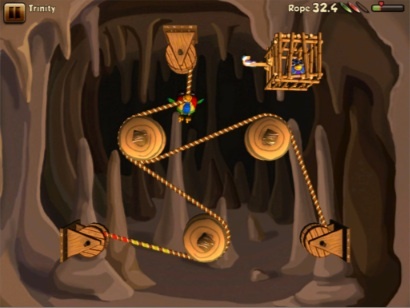 Like any good iPhone and iPad puzzler, Rope Rescue features simple controls, an easy to understand premise and progressively difficult play, wrapped within an eye catching presentation. As the story goes, King Bat grows jealous of the beautiful parrots, resulting in the evil monarch kidnapping all the babies and stashing the little tykes in cages in the hopes of stealing their features. This is where you come in. 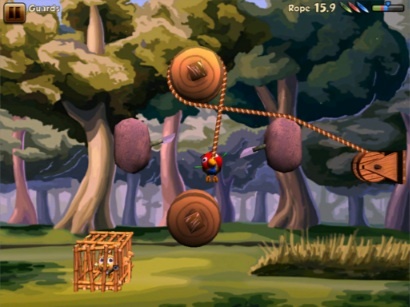 Each of the game's 60 levels task you with wrapping a set length of rope around wheels and then attaching the end to a cage. Do this successfully, and the door opens, setting the captives free while sending you to the next stage. Even better, there's more than one way to get the job done. Using less rope, for instance, increases the chance of scoring more feathers per level, which equate to gold stars in other games. The developers even hid butterflies for you to find. That said, Rope Rescue packs quite a challenge in the form of obstacles such as knives, fireballs and enemies that can slice and burn right through the rope; it's game over if it breaks. Things get even crazier in the time based levels, where you have 20 seconds to open the cage door while narrowly escaping fireballs and other hazards. Is Rope Rescue the Angry Birds killer Chillingo so desperately seeks? It's a bit early to say, but the App definitely has potential. Look for it, and our review, next month.